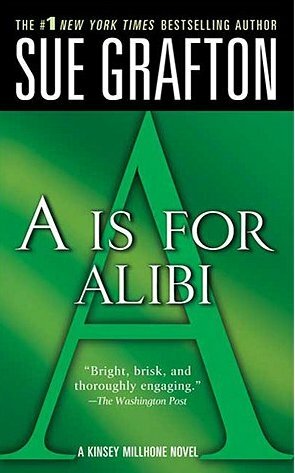 I love Sue Grafton’s alphabet series of novels, and have been thinking about them a lot because they suddenly came to an end with Grafton’s unexpected death in late December. Why do I like them so much? Partly because they are all about money. The series started in the early 1980s with A Is for Alibi and proceeded through last year’s Y Is for Yesterday. It’s not like I’m alone in loving this series; it’s hugely popular, and its 25-book deployment of female detective Kinsey Millhone was often praised as one of the first to feature a woman cracking cases. As a result, many articles on Grafton’s death focused on her role in opening the mystery genre — once an almost exclusive province of hard-boiled guys — to women. Sue Grafton often stated that she was a fan of Ross Macdonald’s Lew Archer (one of those classic hard-boiled detectives) and she set her books in the same fictional town: Santa Teresa, California, a thinly disguised Santa Barbara. That’s cool, in terms of literary history and all — I didn’t know that when I grabbed the first one off the shelf many moons ago. I did know within 10 pages that I was going to read every single book in the series, because I loved Kinsey Millhone’s voice. Why? Partly because she tells us about money from the get-go — and what she tells us is that she doesn’t have a lot, but she’s completely okay with that. She’s self-sufficient, and she likes it that way. Her car: “I like my car cramped.” She drives a battered VW, with dents, and a jumble of stuff in the back. I loved this. But why? Well, on the simplest level, it was relatable. I didn’t earn a lot of money but I made ends meet. I had a jumble of stuff in the back of my car. I lived in more than 15 feet, but it was still pretty small. In Kinsey, Sue Grafton created a relatable heroine. More than that, she created one who existed in a luxe town, where a fictional heroine might easily have felt envy about the money that surrounded her, or jealousy, or even deprivation, panic, or rage. Grafton’s heroine also might have been very concerned with female beauty and presentation, because that’s an association many people have with southern California. In fact, Kinsey’s first client is a blonde beauty who (perhaps) killed a rich lawyer, her husband. So white-blond beauties exist in this fictional universe; they just aren’t our heroine. Instead, our heroine cuts her own hair with nail scissors, shows familiarity with grocery coupons, has a wry word or two to say about the financial upper crust (and their abjection), scores a McDonald’s quarter pounder with cheese when she hits the road, and drags out the same old black, wrinkle-free dress when she has to go to a party — and that’s has to go, as in she’d rather not. I was pretty captivated by Kinsey’s lack of female propriety, the lack of luxe envy, and the complete lack of interest in being blond and thin. The alphabet series is also very clear-eyed about money, what it can do, and what it can’t. As A Is for Alibi tells us straight off, a lot of Santa Teresa is rich. Many of the plots deal with the perils of wanting, having, losing, or gaining a lot of money, and we’re talking divorce, blackmail, or robbery. Through it all, Kinsey is wryly content with her financial position while casting a coolly observant eye on the financial extremes of southern California. In that, her self-sufficiency is almost a moral position, placing her in a different psychological space than the mystery-generating emotions of envy, jealousy, and so on. If detectives set the moral order right after it’s been set wrong by crime, part of Kinsey’s gift is to have the right take on the emotions that lead to crime. She’s also a down-to-earth egalitarian, treating every person she meets with the same humanity and respect: rich businessperson, famous movie star, or homeless person squatting on her landlord’s yard. Later in the series, that landlord, Henry Pitts, upgrades her digs so that she literally has a bedroom with a view — the sky. She’s enlarging her circumference, of course. But it also seemed like the literalization of something I always liked about Kinsey. She was the master of all she surveyed, always, no matter how much money or square footage she had. Why? Just because she saw clearly, knew her own mind, and wasn’t unduly impressed by any financial circumstance. I think Kinsey Millhone holds several intriguing places in the history of the mystery genre. One of them is the “she’s the new version of the hard-boiled male detective,” of course. The other is that Kinsey is an updated, and older, Nancy Drew. Just because hard-boiled detectives were once mainly men, it doesn’t mean that all detectives were. In the ranks of juvenile literature, adventurous girls surely detected. But Grafton’s revamping of the Nancy Drew series for the first time makes a witty adult woman of ordinary financial means the star of the show. Nancy Drew, remember, is economically privileged. In early twentieth-century America, she had a red roadster, a family housekeeper, and a lawyer father. Kinsey has no such patrimony or paid help. She’s an orphan raised by an aunt whose idea of weekend recreation is shooting a gun at the local range. But there is a swap going on. In Kinsey, Grafton gave us a dented VW for the shiny red roadster and a fatherly (part-time baker) landlord in lieu of both housekeeper and father. And for Nancy’s sense of entitlement, which is there in Carolyn Keene’s books (if pretty subterranean), she gave us Kinsey’s sassy ability to shut the door on her own space and raise an eyebrow at the foibles of the rich and poor alike. I’m really going to miss this series, which now will never make it to Grafton’s stated endpoint of Z. Thanks, Sue Grafton, for many a happy read. Rita Williams is a writer, researcher, and teacher who loves words and archives. She blogs on culture, the arts, and education at Retaining the Meta: Adventures of a Midlife PhD. She also works as a ghostwriter on a wide variety of topics, including education and personal finance.